This article is about the 1969 US space mission. For the Adam Ant song, see Vive Le Rock. The three-person crew consisted of Commander James McDivitt, Command Module Pilot David Scott, and Lunar Module Pilot Rusty Schweickart. During the ten-day mission, they tested systems and procedures critical to landing on the Moon, including the LM engines, backpack life support systems, navigation systems, and docking maneuvers. After launching on March 3, 1969, the crew performed the first crewed flight of a LM, the first docking and extraction of a LM, one two-person spacewalk (EVA), and the second docking of two crewed spacecraft—two months after the Soviets performed a spacewalk crew transfer between Soyuz 4 and Soyuz 5. The mission concluded on March 13 and was a full success. It proved the LM worthy of crewed spaceflight, thus setting the stage for the dress rehearsal for the lunar landing, Apollo 10, before the ultimate goal, landing on the Moon. In April 1966, McDivitt, Scott, and Schweickart were selected by Deke Slayton as the second Apollo crew, as backup to Gus Grissom, Ed White, and Roger Chaffee for the first crewed Earth orbital test flight of the block I command and service module, designated AS-204 expected to fly in late 1966. This was to be followed by a second block I flight, AS-205, to be crewed by Wally Schirra, Donn Eisele, and Walter Cunningham. The third crewed mission, designated AS-207/208, was planned to fly the block II command module and the lunar module in Earth orbit, launched on separate Saturn IBs, with a crew to be named. However, delays in the block I CSM development pushed AS-204 into 1967. By December 1966, the original AS-205 mission was cancelled, Schirra's crew was named as Grissom's backup, and McDivitt's crew was promoted to prime crew for the LM test mission, re-designated AS-205/208. On January 26, 1967, they were training for this flight, expected to occur in late 1967, in the first block II Command Module 101 at the North American plant in Downey, California. The next day, Grissom's crew were conducting a launch-pad test for their planned February 21 mission, which they named Apollo 1, when a fire broke out in the cabin, killing all three men and putting an 18-month hold on the crewed program while the block II command module (CM) and A7L pressure suit were redesigned for safety. As it turned out, a 1967 launch of AS-205/208 would have been impossible even without the Apollo 1 accident, as problems with the LM delayed its first un-crewed test flight until January 1968. NASA was able to use the 18-month hiatus to catch up with development and un-crewed testing of the LM and the Saturn V launch vehicle. By October 1967, planning for crewed flights resumed, with Apollo 7 being the first Earth orbit CSM flight (now known as the C mission) in October 1968 given to Schirra's crew. McDivitt's mission (now known as the D Mission) was launched as Apollo 8 in December 1968, and used a single Saturn V instead of the two Saturn IBs. This would be followed by a higher Earth orbit flight (E Mission), crewed by Frank Borman, Michael Collins, and William Anders in early 1969. However, LM problems again prevented it from being ready for the D mission by December, so NASA officials created another mission for Apollo 8 using the Saturn V to launch only the CSM on the first crewed flight to orbit the Moon, and the E mission was cancelled as unnecessary. Slayton asked McDivitt and Borman which mission they preferred to fly; McDivitt wanted to fly the LM, while Borman volunteered for the pioneering lunar flight. Therefore, Slayton swapped the crews, and McDivitt's crew flew Apollo 9. The crew swap also affected who would be the first crew to land on the Moon; when the crews for Apollo 8 and 9 were swapped, their backup crews were also swapped. Since the rule of thumb was for backup crews to fly as prime crew three missions later, this put Neil Armstrong's crew (Borman's backup) in position for the first landing mission Apollo 11 instead of Pete Conrad's crew, who made the second landing on Apollo 12. * Alan L. Bean. replaced Clifton C. Williams Jr. who was killed in October 1967 when the T-38 he was flying crashed near Tallahassee. The Saturn V (AS-504) used on Apollo 9 was the fourth to be flown, the second to carry astronauts to space, and the first to bear a lunar module. Although similar in configuration to the Saturn V used on Apollo 8, a number of changes were made. The inner core of the F-1 engine chamber in the first (S-IC) stage was removed, thus saving weight and allowing for a slight increase in specific impulse. Weight was also saved by replacing the skins of the liquid oxygen tanks with lighter ones, and by providing lighter versions of other components. Efficiency was increased in the S-II second stage with uprated J-2 engines, and through a closed-loop propellant utilization system rather than Apollo 8's open-loop system. Apollo 9 used CSM-104, the third Block II CSM to be flown with astronauts aboard. Apollo 8 needed no equipment for docking with a LM; Apollo 9 flew the probe-and-drogue assembly used for docking; along with other equipment added near the forward hatch of the CM, this allowed for rigid docking of the two craft, and for internal transfer between CM and LM. Had the switch in missions between Apollo 8 and 9 not occurred, the earth-orbit mission would have flown CSM-103, which flew on Apollo 8. The earth-orbit mission was originally supposed to use LM-2 as its lunar module, but the crew found numerous flaws in LM-2, many associated with it being the first flight-ready lunar module off Grumman's production line. The delay occasioned by the switch in missions allowed LM-3 to be available, a machine the crew found far superior. LM-2 never flew in space and is in the National Air and Space Museum. Originally scheduled to launch on February 28, 1969, the liftoff of Apollo 9 was postponed because all three astronauts had colds, and NASA did not want to take the risk that the mission might be affected. Around-the-clock labor shifts were required to keep the spacecraft in readiness; the delay cost $500,000. The rocket launched from KSC at 11:00:00 EST (16:00:00 GMT) on March 3. Present in the firing control room was Vice President Spiro Agnew on behalf of the new Nixon administration. The mission's purpose was to qualify the LM for crewed lunar flight, demonstrating, among other things, that it could perform the maneuvers in space that would be needed for a lunar landing, including docking with the CSM. McDivitt reported a smooth ride, although there was some vibration and the astronauts were surprised to be pushed forward when the Saturn V's first stage stopped firing, before its second stage took over, when they were pushed back into their couches, Each of the first two stages slightly underperformed; a deficiency made up, more or less, by the S-IVB third stage. Once that third stage cut out at 00:11:04.7 into the mission, Apollo 9 entered a parking orbit of 102.3 by 103.9 miles. The crew began their first major orbital task with the separation of the CSM from the S-IVB at 2:41:16 into the mission, seeking to turn around and then dock with the LM, which was on the end of the S-IVB, after which the combined spacecraft would separate from the rocket. If it was not possible to make such a docking, the lunar landing could not take place. It was Scott's responsibility to fly the CSM, which he did to a successful docking, as the probe and drogue docking assembly worked properly. After McDivitt and Schweickart inspected the tunnel connecting the CM and LM, the assembled spacecraft separated from the S-IVB. The next task was to demonstrate that two docked spacecraft could be maneuvered by one engine. The five-second burn took place at 5:59.01.1 into the mission, after which Scott excitedly reported the LM was still in place. Thereafter, the S-IVB was fired again, and the stage was sent into solar orbit. From 09:00:00 to 19:30:00, a sleep period was scheduled. The astronauts slept well, but complained of being woken by foreign-language transmissions, possibly in Chinese. The highlight of the second day in orbit (March 4) was three burns of the SM's SPS. The initial burn, at 22:12:04.1, lasted 110 seconds, and including swiveling or "gimbaling" the engine to test whether the autopilot could dampen the induced oscillations, which it did within five seconds. Two more SPS burns followed, lightening the SM's fuel load. The spacecraft and engine passed every test, sometimes proving more robust than expected. The performance of the CSM in remaining stable while the engine was being gimbaled would in 1972 help cause McDivitt, by then Apollo Program Manager, to approve the continuation of Apollo 16 when its CSM was experiencing an unstable gimbal after separation from its LM. The flight plan for the third day in space was to have the commander and lunar module pilot enter the LM to check out its systems and use its descent engine to move the entire spacecraft. The descent engine was the backup to the SPS; the ability to use the descent engine in this manner would prove critical on Apollo 13. The flight plan was thrown into question when Schweickart vomited, suffering from space adaptation sickness and McDivitt felt queasy as well. They had been avoiding sudden physical motions, but the contortion-like maneuvers to don their space suits for the LM checkout caused them to feel ill. The experience would teach the doctors enough about the sickness to have the astronauts avoid it on the lunar landings, but at the time Schweickart feared his vomiting might endanger Kennedy's goal. They were well enough to continue with the day's plan, and entered the LM, thus transferring between vehicles for the first time in the US space program, and making the first ever transfer without needing to spacewalk, as Soviet cosmonauts had. The hatches were closed, though the modules remained docked, showing that Spider's communications and life support systems would work in isolation from those of Gumdrop. On command, the landing legs sprang into the position they would assume for landing on the Moon. In the LM, Schweickart vomited again, causing McDivitt to request a private channel to the doctors in Houston. The first episode had not been reported to the ground because of its brief nature, and when the media learned what had happened to Schweickart, there were "repercussions and a spate of unfriendly stories". They finished the LM checkout, including the successful firing of the descent engine, and returned to Scott in Gumdrop. The burn lasted 367 seconds and simulated the throttle pattern to be used during the landing on the Moon. After they returned, a fifth firing of the SPS was made, designed to circularize Apollo 9's orbit in preparation for the rendezvous. This took place at 54:26:12.3, raising the craft's orbit to 142 by 149 miles. The fourth day's program (March 6) was for Schweickart to exit the hatch on the LM and make his way along the outside of the spacecraft to the CM's hatch, where Scott would stand by to assist, demonstrating that this could be done in the event of an emergency. Schweickart was to wear the life support backpack, or PLSS, to be worn on the lunar surface EVAS, This was the only EVA scheduled prior to the lunar landing, and thus the only opportunity to test the PLSS in space. McDivitt initially cancelled the EVA due to Schweickart's condition, but with the lunar module pilot feeling better, decided to allow him to exit the LM, and once he was there, to move around the LM's exterior using handholds. Scott stood in the CM's hatch; both men retrieved experiments from the exterior of their vehicles. Schweickart found moving around easier than it had been in simulations; both he and Scott were confident that Schweickart could have completed the exterior transfer if called upon to do so, but considered it unnecessary. On March 7, the fifth day, came the crucial test of the mission, came "the key event of the entire mission: the separation and rendezvous of the lunar module and the command module". The lunar module lacked the capability to return the astronauts to Earth. 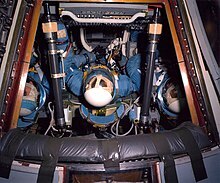 McDivitt and Schweickart entered the LM early, having obtained permission to do so without their helmets and gloves, making it easier to set up the LM. When Scott in Gumdrop pushed the button to release the LM, it initially hung on the latches at the end of the docking probe, but he hit the button again and Spider was released. After spending about 45 minutes near Gumdrop, Spider went into a slightly higher orbit, meaning that over time, the two craft would separate, with Gumdrop ahead. Over the next hours, McDivitt fired the LM's descent engine at various throttle settings; by the end of the day the LM was thoroughly test-flown. At a distance of 185 kilometres (115 mi), Spider fired to lower its orbit and thus begin to catch up with Gumdrop, a process that would take over two hours, and the descent stage was jettisoned. The approach and rendezvous were conducted as near as possible to what was planned for the lunar missions. In order to show that rendezvous could be performed by either craft, Spider was the active party during the maneuver. McDivitt brought Spider close to Gumdrop, then maneuvered the LM to show each side to Scott, allowing him to inspect for any damage. Then, McDivitt docked the craft. Due to glare from the Sun, he had trouble doing this and Scott guided him in. During the later missions, the job of docking the two spacecraft in lunar orbit would fall to the command module pilot. After McDivitt and Schweickart returned to Gumdrop, Spider was jettisoned, its engine fired to fuel depletion remotely by Mission Control as part of further testing of the engine, simulating an ascent stage's climb from the lunar surface. This raised Spider to an orbit with apogee of over 4,300 miles (6,900 km). NASA officials predicted that Spider would remain in orbit for 18 years. The only major lunar module system not fully tested was the landing radar, as this could not be done in Earth orbit. Apollo 9 needed to remain in space for about ten days to check how the CSM would perform over the period of time required for a lunar mission. The remaining days in orbit were to be conducted at a more leisurely pace. With the main goals of the mission accomplished, the hatch window was used for special photography of Earth, using four identical Hasselblad cameras, coupled together and using different filters and film. This allowed different features of the Earth's surface to appear, for example, tracking of water pollution as it exits mouths of rivers into the sea. This tested a system that might be used on future satellites. Scott also used a sextant to track landmarks on the Earth, and turned the instrument to the skies to observe the planet Jupiter. These activities practiced navigation techniques that were to be used on later missions. Also on the sixth day, a burn of the SPS engine (the sixth such burn of the mission) took place, though it was postponed one orbit as the reaction control system (RCS) thruster burn needed to settle the reactants in their tanks was not properly programmed. The SPS burn lowered the perigee of Apollo 9's orbit, allowing for improved RCS thruster deorbit capability as a backup to the SPS. Considerable testing of the CSM took place, but this was principally Scott's responsibility, allowing McDivitt and Schweickart leisure to observe the Earth; they alerted Scott if anything particularly noteworthy was upcoming, letting him leave his work for a moment to look at Earth too. The seventh burn of the SPS system took place on the eighth day, March 10, its purpose was again to aid RCS deorbit capability, as well as extending Gumdrop's orbital lifetime. It shifted the apogee of the orbit to the Southern Hemisphere, allowing for a longer free-fall time to entry when Apollo 9 returned to Earth. The burn was extended to allow allow for testing of the propellent gaging system, which had been behaving anomalously during earlier SPS burns. Once it was accomplished, Apollo 9's RCS thrusters could have returned it to Earth and still allowed it to land in the primary recovery zone had the SMS engine failed. The eighth and final SPS burn was accomplished on March 13, less than an hour after the ten-day mark of the mission, after which the service module was jettisoned. The landing was delayed one orbit because of unfavorable weather in the primary landing zone some 250 miles (400 km) ESE of Bermuda. Instead, Apollo 9 splashed down 180 miles (290 km) east of the Bahamas, about 3 miles (4.8 km) from the recovery carrier, the USS Guadalcanal, after a mission lasting 10 days, 1 hour, 54 minutes. Apollo 9 was the last spacecraft to splash down in the Atlantic Ocean until the Crew Dragon Demo-1 mission in 2019. For this and all subsequent Apollo flights, the crews were allowed to name their own spacecraft (the last spacecraft to have been named was Gemini 3). The gangly LM was named Spider, and the CSM was labeled Gumdrop because of the Command Module's shape, and because of the blue wrapping in which the craft arrived at Kennedy Space Center. These names were required as radio call signs when the vehicles flew independently. This test flight represented the first flight of a crewed spacecraft that was not equipped to reenter the Earth's atmosphere. The circular patch shows a drawing of a Saturn V rocket with the letters USA on it. To its right, an Apollo CSM is shown next to an LM, with the CSM's nose pointed at the "front door" of the LM rather than at its top docking port. The CSM is trailing rocket fire in a circle. The crew's names are along the top edge of the circle, with APOLLO IX at the bottom. The "D" in McDivitt's name is filled with red to mark that this was the "D mission" in the alphabetic sequence of Apollo missions. The patch was designed by Allen Stevens of Rockwell International. The Apollo 9 Command Module Gumdrop (1969-018A) is on display at the San Diego Air & Space Museum. Gumdrop was formerly displayed at the Michigan Space and Science Center, Jackson, Michigan, until April 2004 when the center closed. The Apollo 9 service module (SM) was jettisoned shortly after the deorbit burn and reentered the atmosphere. The ascent stage of LM-3 Spider (1969-018C) reentered on October 23, 1981. The descent stage of LM-3 Spider (1969-018D) reentered on March 22, 1969. The S-IVB was sent into solar orbit, with initial aphelion of 80,093,617 miles (128,898,182 km), perihelion of 44,832,845 miles (72,151,470 km) and orbital period of 245 days. It remains in solar orbit as of 2019[update]. ^ Orloff, Richard W. (September 2004) [First published 2000]. "Table of Contents". Apollo by the Numbers: A Statistical Reference. NASA History Division, Office of Policy and Plans. NASA History Series. Washington, D.C.: NASA. ISBN 0-16-050631-X. LCCN 00061677. NASA SP-2000-4029. Retrieved June 27, 2013. ^ "Apollo 9". NASA. July 8, 2009. Retrieved December 11, 2018. ^ "'Open End' Orbit Planned for Apollo". The Pittsburgh Press. Pittsburgh, PA. United Press International. August 4, 1966. p. 20. Retrieved November 11, 2010. ^ Brooks, Courtney G.; Grimwood, James M.; Swenson, Loyd S. Jr. (1979). "Preparations for the First Manned Apollo Mission". Chariots for Apollo: A History of Manned Lunar Spacecraft. NASA History Series. Foreword by Samuel C. Phillips. Washington, D.C.: Scientific and Technical Information Branch, NASA. ISBN 0-486-46756-2. OCLC 4664449. NASA SP-4205. Retrieved January 29, 2008. ^ "Apollo Image Gallery: Early Apollo". Project Apollo Archive. Kipp Teague. Retrieved August 3, 2010. ^ Brooks, Courtney G.; Grimwood, James M.; Swenson, Loyd S. Jr. (1979). "Apollo 5: The Lunar Module's Debut". Chariots for Apollo: A History of Manned Lunar Spacecraft. NASA History Series. Foreword by Samuel C. Phillips. Washington, D.C.: Scientific and Technical Information Branch, NASA. ISBN 0-486-46756-2. OCLC 4664449. NASA SP-4205. Retrieved January 29, 2008. ^ a b "Apollo 9 Crew". The Apollo Program. Washington, D.C.: National Air and Space Museum. Retrieved 10 May 2015. ^ Howell, Elizabeth (May 26, 2018). "Alan Bean: From Astronaut to Artist". Space.com. Retrieved December 11, 2018. ^ "Preparations for Launch". NASA. Retrieved December 29, 2017. ^ Press Kit, p. 8. ^ Mission Report, pp. A-59, inside back cover. ^ Mission Report, pp. A-1, inside back cover. ^ French & Burgess, pp. 338–339. ^ French & Burgess, p. 339. ^ a b Science News 1969-03-15, p. 255. ^ a b Mission Report, p. 1-1. ^ a b c d e f g h i j k l m Brooks, et al. 1979, Chapter 12.5: "Apollo 9: Earth orbital trials"
^ a b Mission Report, p. 3-2. ^ Mission Report, p. 7-1. ^ a b c d Mission Report, p. 3-4. ^ Mission Report, pp. 3-6–3-7. ^ a b Wilford, John Noble (March 5, 1969). "Apollo 9 proves its linkup is firm". The New York Times. pp. 1, 20. ^ French & Burgess, p. 343. ^ Press Kit, pp. 3–4. ^ French & Burgess, pp. 344–345. ^ a b c "Apollo 9". NASA. July 8, 2009. Retrieved April 2, 2019. ^ Mission Report, p. 3-1. ^ Press Kit, pp. 4–5. ^ Brooks, et al. 1979, Chapter 12.4: "The mission and the men". ^ Science News 1969-03-01, p. 218. ^ French & Burgess, pp. 349–350. ^ French & Burgess, pp. 350–351. ^ French & Burgess, pp. 351–352. ^ a b French & Burgess, p. 352. ^ Science News 1969-03-22a, p. 277. ^ Science News 1969-03-22a, pp. 277–278. ^ Press Kit, pp. 2,6. ^ Wilford, John Noble (March 10, 1969). "The Apollo 9 astronauts take a restful cruise through space". The New York Times. ^ Press Kit, pp. 6, 22. ^ French & Burgess, pp. 352–353. ^ Press Kit, p. 22. ^ Mission Report, p. 1–2. ^ Mission Report, p. 7-4. ^ a b Press Kit, p. 7. ^ French & Burgess, p. 353. ^ Mission Report, p. 1-2. ^ Moran, Norah (March 8, 2019). "Crew Dragon splashes down in Atlantic ending first commercial crew mission". NASA. Retrieved April 17, 2019. ^ Hengeveld, Ed (May 20, 2008). "The man behind the Moon mission patches". collectSPACE. Retrieved July 18, 2009. "A version of this article was published concurrently in the British Interplanetary Society's Spaceflight magazine." ^ "Apollo IX Command Module". San Diego Air & Space Museum. Retrieved December 13, 2018. ^ "Jackson, MI – Michigan Space Center (Closed)". www.roadsideamerica.com. ^ a b "Apollo 9". National Space Science Data Center. NASA. Retrieved April 7, 2014. ^ Mission Report, p. 7-2. ^ "Saturn S-IVB-504N – Satellite Information". Satellite database. Heavens-Above. Retrieved September 23, 2013. Brooks, Courtney G.; Grimwood, James M.; Swenson, Loyd S., Jr. (1979). Chariots for Apollo: A History of Manned Lunar Spacecraft. The NASA History Series. Foreword by Samuel C. Phillips. Washington, D.C.: Scientific and Technical Information Branch, NASA. ISBN 978-0-486-46756-6. LCCN 79001042. OCLC 4664449. NASA SP-4205. Retrieved April 1, 2019. Eberhart, Jonathan (March 1, 1969). "Moonward by jungle gym". Science News: 218–219. JSTOR 4548203. (Subscription required (help)). French, Francis; Burgess, Colin (2010) . In the Shadow of the Moon. Lincoln, NE: University of Nebraska Press. ISBN 978-0-8032-2979-2. Apollo 9 Mission Report (PDF). Houston, TX: NASA. 1969. Apollo 9 Press Kit (PDF). Houston, TX: NASA. 1969. "Apollo: Healthy in mid-flight". Science News: 255. March 15, 1969. JSTOR 3954137. (Subscription required (help)). "Spider makes its mark". Science News: 277–278. March 22, 1969. JSTOR 3953852. (Subscription required (help)). "Space sciences". Science News: 283. March 22, 1969. JSTOR 3953857. (Subscription required (help)). Baker, David (1982). The History of Manned Space Flight (1st ed.). New York: Crown Publishers. ISBN 0-517-54377-X. Wikimedia Commons has media related to Apollo 9. "Appendix 6 – Crews and Support for Manned Apollo Flights". The Apollo Spacecraft: A Chronology. Volume IV. NASA. 1978. OCLC 23818. NASA SP-4009. Archived from the original on February 5, 2008. Retrieved January 29, 2008.